Looking for the perfect, modern summer cardigan pattern? Well look no further because this is it right her friends!!! Anyone that knows me or follows me knows I LOVE CARDIGANS!!! I am OBSESSED with the way this Forever Cardigan works up. Its a Fresh and Modern take on a summer cardigan. To top it off, this cardigan pattern is completely customizable to suit your preferences. Isn't that awesome?? The front has a flowy drape to it, so you can leave it down or you can cross the top and make it more of a blanket cardigan. The options are completely your own! This Cardigan pattern is also worked up in 1 piece... That's right... ONE PIECE!! You work this cardigan from the bottom up with NO SEEMS!! It is also TESTER APPROVED. Well it's Finally Ready... 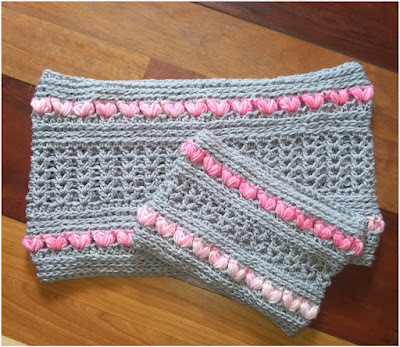 The V-day Heart Cowl- Mommy & Me Set!! Just in time for Valentines Day.💞 This would be a Perfect & Easy Gift for the day we Celebrate LOVE! Click here for a FREE Pdf . So I was working on a new sweater design, when I had the brilliant idea of making matching matching Cowls. Then I thought, why not make it into a Mommy & Me Set?? Right?! Everyone loves a matching Mommy & Me Set. Well it's Finally Ready... 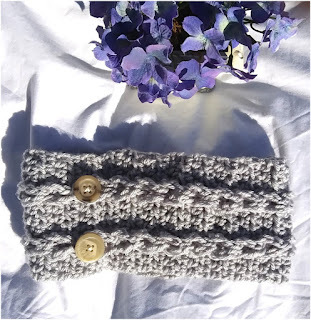 The Braided With Love Ear Warmer!! Just in time for Valentines Day.💞 This would be a Perfect & Easy Gift for the day we Celebrate LOVE!! This is such a fun and fast pattern. In less than 1 hour, you are already done and onto your next. 😉 I designed this cute ear warmer to match my Braided With Love Jacket pattern. *Head circumference is actual head measurement. Are you or anyone you know a Cowl Lover? Do you love it when your hat & cowl match? Well this is the cowl for you. I designed the Aaliyah's Puff Stitch Beanie & decided to make a matching cowl. It is worked into one piece and is completely customizable to your desired length preference. 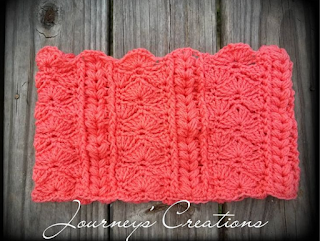 I decided to name this Cowl after my beautiful & oldest daughter Aaliyah. I wanted to design something cute but was still my type of style, which I would I'd consider as Boho Chic. I was looking through pinterest and fell In LOVE with Vanessa Montoro's designs. They are AMAZING!! Anyway, I found one of her dresses & was immediately drawn to a specific little section. I loved it so much that I tried to blow it up to a bigger size and recreate that look. Welcome to Journey Chanel Designs!! I'm so happy you came here. My name is Anastasia Smith, and I am a wife, mother to 4 beautiful little girls, and I have a love for all things Crochet and Yarn related. I am a stay at home mom who decided to get back into crocheting as a way to relax and make cute items for my girls. It went from just baby tops and dresses to now I design Children and Adult clothing in sizes preemie to 5 & 6 XL. I first got into crochet when I was 8 years old. My parents had decided to visit my grandparents who then in turn decided to go on a road trip to meet my grandfather's side of the family. Well I got to meet my grandfather's sister and she was working on a big granny square blanket. I thought it was the coolest thing I had seen. So will everyone was over visiting each other, I was learning how to crochet with my Great Aunt. After a long 22 years I can now proudly say that I now design items for not only children and Adults but for ALL sized women from S-6 XL. I want to see my customers happy from the patterns I design.